A group of hikers have started an 805 kilometer trip that will cross the southwestern state of New Mexico. Their goal is to map out the best path for the Rio Grande Trail. New Mexico wants to follow the examples of other states that have created long hiking trails. The state has many beautiful areas, mild weather and cultural resources. Officials now want to create a long-distance trail along one of North America's longest rivers. The Rio Grande flows through the middle of the state, from the Rocky Mountains in the north to a desert area near the border with Mexico and Texas. Supporters of the project say the Rio Grande Trail could possibly become one of the country's famous long-distance trails. Other popular trails in America include the Appalachian Trail. It runs from the state of Georgia in the south to Maine in the north. The Continental Divide Trail that crosses many Western states is another famous trail. The neighboring states of Colorado and Arizona also have their own long-distance trails. Outdoor recreation in New Mexico is already an important industry. Jeff Steinborn, a New Mexico state senator, thinks the benefits of the Rio Grande Trail could be huge. He supported legislation in 2015 to create a group to establish the trail. In the eastern U.S., more than 3 million people visit some part of the Appalachian Trail each year. An organization called the Appalachian Trail Conservancy is working on a study to better understand the spending from trail visitors. It is also researching ways to bring attention to long-distance trail systems. Jordan Bowman is a spokesperson for the organization. He said people enjoy exploring the American backcountry. He said the trail offers people the opportunity to experience many things from easy afternoon walks to months-long adventures. 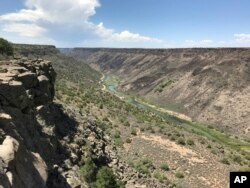 In New Mexico, the Rio Grande Trail Commission last week approved an official trail image, and a master plan is also being developed. This month's hiking trip by volunteers from the Southern New Mexico Trail Alliance is aimed at exploring parts of the proposed future trail. They are expected to gather information about water supplies, camping areas, supply stops and not-to-be-missed scenery. Peter Livingstone of the alliance said his group is looking for "a lot of those little details we can't pick up until we're actually there on the ground walking it." He has traveled more than 190 kilometers in five days. He expects the whole trip to take about a month. A small solar panel sits on the top of his backpack, charging a collection of GPS and satellite communication devices that record his trip. Livingstone’s travels have taken him along the edge of volcanic land that makes up the Rio Grande Gorge near the town of Taos. To the west of the trail, he has found many homes, called earthships, made from recycled materials. To the east is Wheeler Peak, the highest mountain in New Mexico. The trip is expected to end near Mount Cristo Rey, where people come each year to make a religious observance. Steinborn plans to join the hikers there. About 80 kilometers of the trail has already been approved. Steinborn said another 160 kilometers is being planned with the federal government and environmental planners in the Middle Rio Grande area. "It's coming to life in front of our eyes," he said. This story was originally written by The Associated Press. Phil Dierking adapted the story for Learning English. Mario Ritter was the editor.